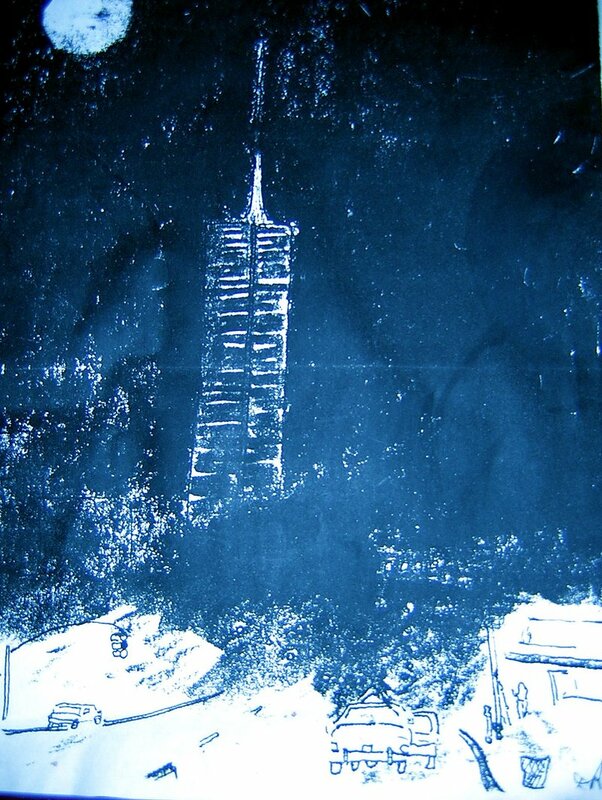 Child-like view of the World Trade Center, drawing done some years before 2001. The view is from the West Village, looking south on Seventh Avenue from Sheridan Square. Note: The gringo caravan is back from sabbatical. Posting should be more frequent, depending on the psychic weather and its global warming. Being in the East, at any rate, doesn't tie you down in a cyclo pedicab or tuk-tuk or moto-dop anymore. That old Vietnam/Indochina thing is over (speaking to those who know it once existed.) We internuts realize how inter-connected everything's gotten, right? You can do almost anything from almost anywhere. You want to study cyclical human weather patterns that include, but are not limited to, the Asian land mass? How about socialist life and Josip Stalin as only his daughter Svetlana could tell it? How about Sigmund Freud's 'Civilization and its Discontents'? And Leo Tolstoy's imaginative yet devastatingly accurate portrait of a successful judge, his circle and his family life in 'The Death of Ivan Ilyitch'? And social critic Camille Paglia's take-down and punch-out of acadummies and white feminists like the politically correct princesses, among others? And the blazing satire of Petronius Arbiter's fools, slaves, poets and lovers in the time of Nero? And Balzac's aristocratic but passionate zoo of post-Enlightenment Paris, featuring an old man's obsessional love for his two daughters and a young man's plan to conquer one of them on his road to fortune, ('Pere Goriot.') And we cannot forget the masterly Edward Gibbon's account of how, after Rome declined, degenerated and became too 'smart' for its old gods and goddesses, the Arabs and slave converts mounted superb horses, raised the sword of a new monotheism, something culled from Judaism and called 'Islam,' and they conquered from Spain to Egypt to Syria to India---as there were no longer men, or any Caesar or Marius or Augustus or Pompey or Hadrian or Trajan--- or even Constantine---on the scene to stop them. Once mighty Rome, the West incarnate, could now be safely mocked. Sabbaticals can work for multi-tasking. Therapeutic possibilities too. While I laud you on your ambitious summer reading, includung an aquaintence of mine Ms Paglia- who did it her way at Yale, I am left wondering at your conclusion regarding Eddie Gibbons "Decline & Fall" and the islamic swarm into Spain created by a power vaccum in Rome's decline. (I am not the first to point out that Gibbons masterpiece is hardly the last word being published some 125 yrs ago.. and the various Book Of The Month Clubs will offer the nine volumes gratis if you'll kindly sign up to receive their next eight monthy choises and etc...) I'll wager that none of your august readership has waded through Gibbons and maybe a few have heard of it via the bookclub offers. However, Gibbons has emphatically stated that the decline can be mainly attributed to the reduction of the Roman senate to a mere appendage of Ceaser and the debauchery of the citizenry increased expoentially with the consolidation of power in the emporer and the maldistribution of the wealth created from the spoils of war. When Gringoman instructs his unwashed on "Rome becoming too smart for its gods" he means that the Ceasers in their quest of a unitary executive no longer felt bound by the legal and ethical constraints imposed by the religion or the senate. The unravelling of Rome started at the top; though sometimes in these multi-volume tomes it is hard to see the public hot baths from the vomitorium. I am left wondering at your conclusion regarding Eddie Gibbons "Decline & Fall" and the islamic swarm into Spain created by a power vaccum in Rome's decline. "The birth of Mohammed was fortunately placed in the most degenerate and disorderly period of the Persians, the Romans and the barbarians of Europe: the empires of Trajan, or even of Constantine or Charlemagne, would have repelled the assault of the naked Saracens, and the torrent of fanaticism might have been obscurely lost in the sands of Arabia." Great review and an interesting topic. Nice job! I will bookmark your site. I think you are right. .